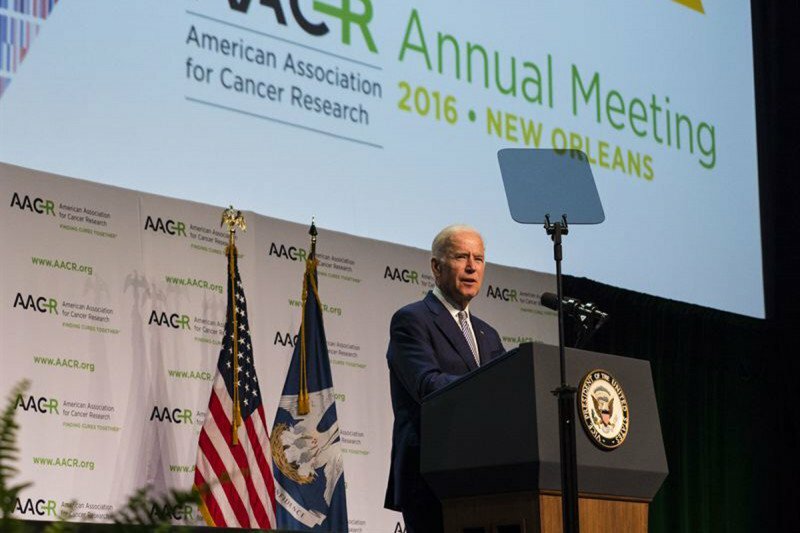 Vice President Joe Biden addressed members of the American Association for Cancer Research on Wednesday in New Orleans. Continuing his work on the National Cancer Moonshot Initiative, Vice President Biden paid a visit to the annual meeting of the American Association for Cancer Research, where he highlighted his goals for cancer research in the coming years and what it will take to get there. “You’ve given humanity a sense of hope — and, I might add, expectation,” the vice president told the crowd of more than 4,000 scientists, who had just spent the past five days presenting and discussing the latest advances in cancer research. That's like asking Derek Jeter to take several years off to sell bonds to build Yankee Stadium. Earlier this year, Mr. Biden met with several members of Memorial Sloan Kettering’s leadership at the World Economic Forum in Davos, Switzerland, to discuss ways to make progress on the moonshot initiative. “This is personal for us, but it’s also bigger than us,” Dr. Biden said in her remarks. The Bidens lost their son Beau in 2015 from a rare brain cancer called glioblastoma. Mr. Biden drew attention to the financial difficulties confronting scientists who pursue research, pointing out that many of them routinely spend a third of their time applying for grants and seeking money to keep their lab running. “That’s like asking Derek Jeter to take several years off to sell bonds to build Yankee Stadium,” he said. Mr. Biden helped broker $2 billion in additional funding for the National Institutes of Health for fiscal year 2016. But he faulted the federal government for taking more than a year to review grant applications and for shying away from funding “outside-the-box” thinking. As part of the moonshot initiative, the National Cancer Institute launched an online engagement platform to enable the research community and the public to submit cancer research ideas, which will be vetted by a Blue Ribbon Panel of scientific experts, including MSK’s own Dr. Sawyers. Read our highlights from the first and second half of AACR.